I love theses mid century modern planters! They are so retro! Here we've brought a few options for whatever your budget might be, after all, we want you to have a cheeky lifestyle and a hip and stylish home! These will be your larger size planters, gorgeous with a fiddle leaf fig tree, palm tree or large cactus or succulent! Wood legs go beautifully with these planters. Go for a minimalist look with a planter in white or cute in rose or a little more masculine in concrete or gray or all out fab in black & gold! The metal legs are so California modern. Large and Mid size, these are a great value and as gorgeous as their pricier counterparts. Cactus, succulents, orchids and mother in law's tongue aka snake plant, all look fantastic in these. Be inventive! This artificial plant below has a fantastic mid century planter at a great price. Replace it for a gorgeous living plant and you are set! Add a pop of color with the cuties below. 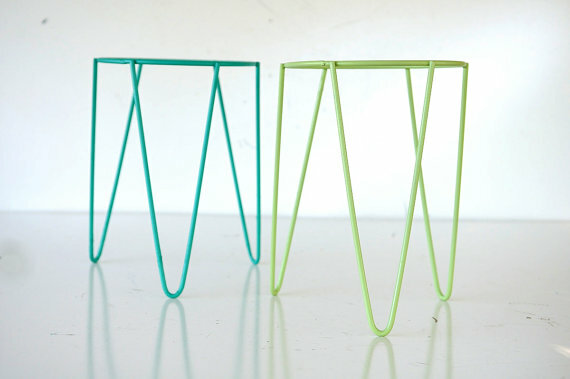 You get 2 hair pin plant stands in Turquoise and Sea Foam Green. Remember to always ask for a discount code or negotiate the price! Cute mid size with wood, hair pin or metal legs. The smaller ones will look great on your dining table, office desk or entry console. Here we have a great option if you're saving your pennies or just like projects! There's something so rewarding about decorating your home with items you've built yourself and this DIY will leave you happy happy happy! You may find the tutorial here. Remember, you will need a chic planter! Are you loving these mid-century modern planters? Which ones will you get? Tell us in the comments.